Welcome to the SourceAudio Music Licensing Buyer Network! The Buyer Network is Live, Connecting Buyers and Sellers in the Cloud! Music Sellers: Connect Directly With Dozens of Buyers in the SourceAudio Cloud! 1. Music buyers will be able to see your presence on the seller network. They'll see your logo, company name, main contact's name, and contact info. They can then preview 5 of your featured tracks and then request access to subscribe to your music. 2. You will get an email notification letting you know that a buyer has requested access to your music. You can see their company name and contact info as well. If you agree to allow them to subscribe, your music, metadata, and all future updates to your own site will sync instantly to their buyer site. 3. Sellers can also view a list of all available buyers on the network. In the same way that buyers can request access to individual libraries, sellers can invite buyers to subscribe to their music. Once an invite is sent, the buyer receives a notification email and can decide to accept the invite and subscribe to the music or they can pass on the invite. 4. Full stats and reporting on a site-by-site basis is fully integrated into the new network. In the existing stats section of all sites, you'll notice a new "Site" selection drop-down. Under that drop-down, you'll see all music buyers subscribing to your music. To see a specific buyer's activity on your music, simply select them from the drop-down and your charts and reporting will update to reflect only that buyer's stats. 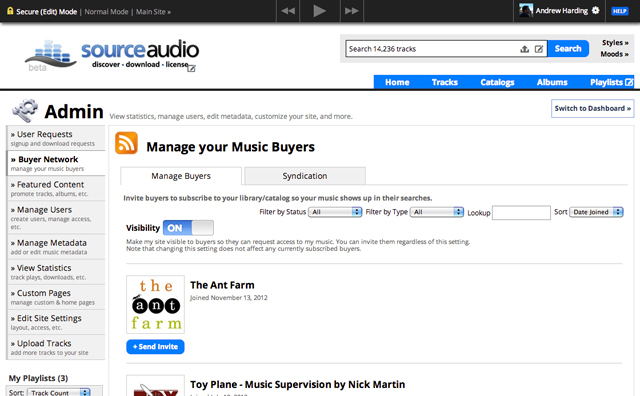 SourceAudio music buyer sites look and work just like music seller sites with only one difference - buyers don't upload or manage music and metadata. They simply subscribe to music and metadata from seller sites. Buyers can only see a seller's music if they've been granted access. Sellers can only syndicate their music to a buyer if the buyer has agreed to subscribe. 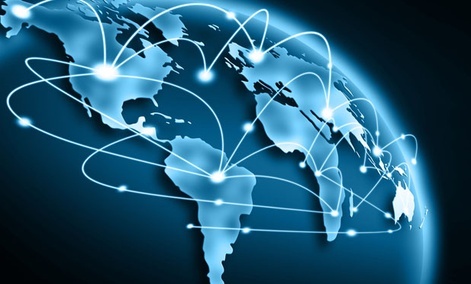 The subscription and syndication experience revolves around a typical invitation/request system so both parties can mutually agree to be connected. I'm a Music Seller, How Do I Get Started? 1. Choose the catalogs on your site that you want to syndicate. Go to your Admin Panel > Buyer Network > Syndication tab. 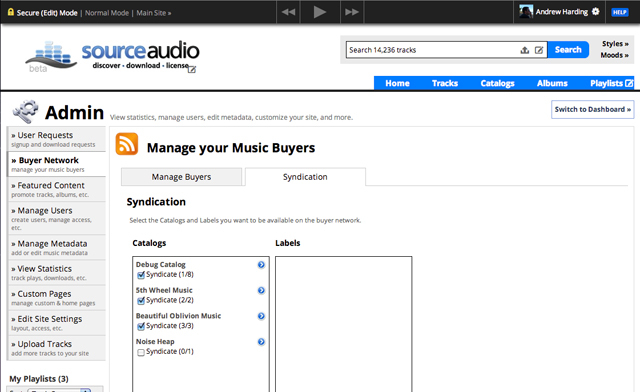 You'll see a list of the available catalogs and labels on your site that can be syndicated (only "master" versions of catalogs can be syndicated so if you sync or sub-publish other catalogs on SourceAudio you won't be able to offer them in the buyer network). Select the catalogs and labels you want to syndicate and click "Save". Then, toggle over to the "Manage Buyers" tab. 2.Turn your visibility toggle "On" or "Off". If it's checked (On) it means all buyers can see you and can request access to your music. If it's not checked (Off) it means that only the specific buyers you have invited will have the opportunity to see and subscribe to your music. They'll get your invites and notifcations as expected but you won't be visible to other buyers in the list. 3. Invite buyers to subscribe! That's it. You can run down the list, click the "Send Invite" button to initiate the invitation process, and the buyer will receive the invite via email. You'll receive a daily notification email that includes all requests, invites, new buyers on the network, and other updates that are relevant to your site. If you don't get an email on any given day it's simply because nobody tried to contact you and no new buyers were added to the network. So, just check your inbox for your daily update and get ready to interact with a ton of new buyers! I'm a Music Buyer, How Do I Get Started? Select the catalogs you want to subscribe to. Go to your Admin Panel > Subscriptions section. You'll see a list of libraries that are available to you. To request access to new libraries, click the "Subscribe" button. A notification will be sent to that music seller and they can approve or reject the request. To preview tracks from libraries before you request access to their music, click the "Sample Tracks" icon. You'll see that library's 5 most recent featured tracks appear in the list and you can play them right in line. That's it! Enjoy the New Buyer Network! So go ahead, start sending your invites & requests and keep an eye out for those daily notification emails and enjoy the benefits of the new buyer network!